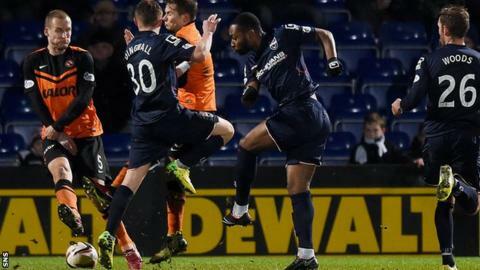 Ross County manager Jim McIntyre felt striker Yoann Arquin's honesty cost his side in the 3-2 home defeat at the hands of Dundee United. Arquin, who scored to make it 3-1, then stayed on his feet when he could have gone down under keeper Radoslaw Cierzniak's challenge. "He's got to go down," McIntyre said. "There's definitely been a touch there. You've got to applaud his honesty but if he doesn't go down there's not a decision to be made." The Staggies produced a fine display against United but were found wanting in the final third. The visitors showed them how it is done by going 3-0 up through Nadir Ciftci's double, either side of Stuart Armstrong's goal. "The one thing you know about United is they counter quickly and invariably they punish you, and they showed their quality." County rallied, however, with Arquin netting before Liam Boyce was sent off and Darren Maatsen made it 3-2 late on. And McIntyre knows his team must learn to be more clinical if they are to move off the foot of the Premiership. "In the first half we got into some great positions and had a couple of real goal-scoring opportunities that we passed up simply because the final ball wasn't good enough or we didn't hit the shot early enough. So that was frustrating," the manager told BBC Scotland. "The one thing you know about United is they counter quickly and invariably they punish you, and they showed their quality when they did that. We need to show a bit more belief and just do things a bit quicker, I thought we were too safe trying to get the ball in the net. "That's the last three weeks we've went behind and we've definitely shown that we've got a bit about us. It's one thing we can't label at the players, they're giving us everything they've got and we just need to keep working hard, keep improving, and try to improve that final bit of quality in the final third."